Robotic arms are modelled after the human arm and offer speed, accuracy and strength that in its sum by far exceed the capabilities of humans. Conversely, an area where the technology of industrial robots had not caught up yet was the sensitivity to external forces. 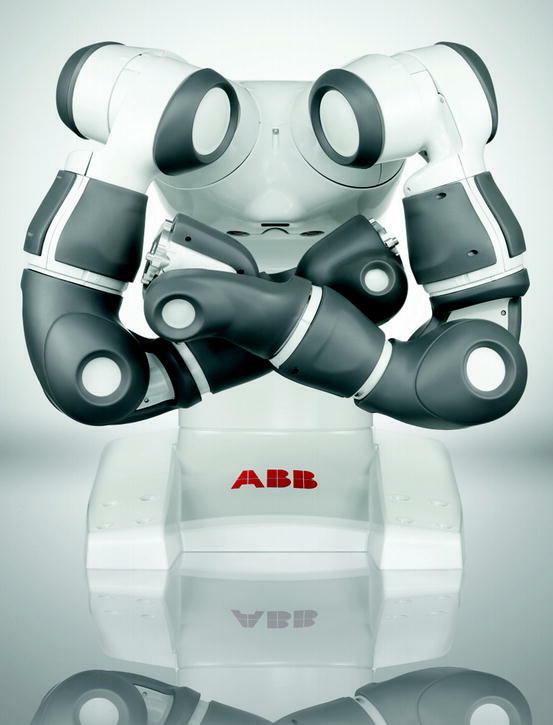 Today, integrated technologies such as ABB Force Control allow robots to react to the forces that are applied to their end-effectors, while the ABB YuMi represents an entirely new kind of sensitive robot that can assemble small parts and collaborate in a safe way with humans. Open image in new window In 1974 the world’s first microcomputer controlled, electric industrial robot IRB6 was installed in Sweden. Since then, robotic arms have become indispensable for a great range of industries, from large-scale automotive installations to single robots that automate tasks at small enterprises. With the development of new interfaces and programming methods, robots are not exclusive to the shop floor anymore, but are utilized for diverse and creative applications, from the research that is being done in the creative industry (Brell-Cokcan and Braumann 2012), to robots working in hotels and entertaining guests on cruise ships (Fig. 1). Among the main reasons for today’s widespread popularity of robotic arms are the robots’ multifunctionality as well as their “superhuman” strength, speed, and accuracy—enabling a robot to perform tasks that would be dangerous, harmful, or even physically impossible for a human worker. However, these attributes also make robots inherently risky, as any machine capable of lifting a 500 kg car chassis can also cause harm to a human. For this reason, combinations of safety-certified software and hardware, from mechanical stops and massive fences to highly reliable 3D cameras, are used to keep the robot within and persons outside its designated workspace. Therefore, robotic arms commonly work best in custom-tailored environments such as the highly efficient manufacturing lines of the automotive industry. 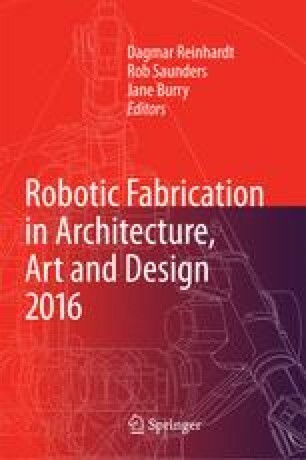 Today, as robotic automation enters new fields, new requirements for robotic arms arise, when companies do not want to set up entirely new spaces for robots, but rather want them working alongside the human workforce where they are applied selectively (Naumann and Fechter 2015) for tasks that they can perform better, safer, or more efficiently. Robot manufacturers such as ABB therefore had to find ways in which to make robots safe to interact with, without requiring complex external safety equipment (Przemyslaw et al. 2014). A first step towards making a robot “safe” to work with is to make it sensitive to outside forces. By default, an industrial robot will follow its programmed path and only stop if any axis reports a torque value exceeding nominal values. 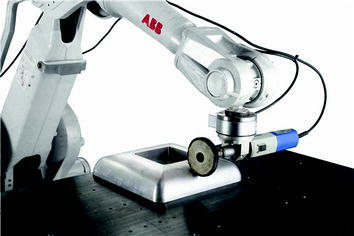 However, for many applications the torque values reported by current industrial robots are not fine-grained enough to ensure a safe and reliable process. 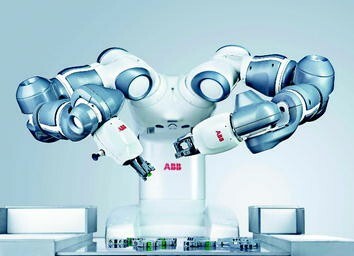 ABB’s Integrated Force Control is thus designed as an add-on for existing industrial robots, consisting of a force sensor that reports all six components of force and torque. On the software side, the sensor feedback can be incorporated into robot programs through a specific set of RAPID instructions, providing real-time tactile feedback. Main applications of force control are grinding, polishing, and deburring (Fig. 2)—all applications where the actual physical object can deviate from the given digital data. By adjusting in real-time for the reported force that the tool applies to the workpiece it is possible to reduce tool-wear and improve the surface finish. The user can choose between two strategies: Force Control “Pressure” keeps the tool at a constant speed and adjusts the toolpath, while Force Control “Speed Change” stays on the programmed path while adjusting the tool’s speed. While Force-Control opens up entirely new applications for industrial robots, it does not automatically make a robot safe to work with, as the sensor provides only data relating to the tool itself. Creating a collaborative robot that is safe in its own required ABB to move away from existing robotic design notions towards new design concepts and kinematics. The ABB IRB 14000 YuMi (Fig. 3) was created as a robot for the fourth industrial revolution, towards enabling the sensitive assembly of affordable, miniaturized, mobile electronics (refer also to Stolt et al. 2012) in collaboration with human workers (Fig. 4). It is equipped with a large range of sensors that allow the YuMi to see and recognize parts, grasp them carefully, and then to snap them together without breaking them. Conceptually, the YuMi is modelled after a human worker, consisting of two seven-axis robotic arms that are controlled by a single controller, which is contained within the robot’s base, weighing a total of 38 kg. The arms themselves are also constructed similar to a human arm, with a strong magnesium skeleton covered by a floating plastic casing, which in turn is wrapped in soft padding. In the case of a collision, the sensors in each axis will detect the force and stop the robot within milliseconds, while the soft construction ensures that neither human nor robot are hurt. Despite its low weight and focus on safety, the YuMi can reach a speed of 1.5 m/s and 0.02 mm repeatability. 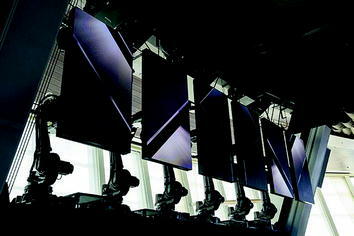 Each arm can manipulate a maximum payload of 0.5 kg within its reach of 559 mm. Its software builds upon existing ABB controllers, but allows a new kind of interactive teaching—so called “Lead Through Programming”—in addition to IRC5 RAPID as in other ABB robots. 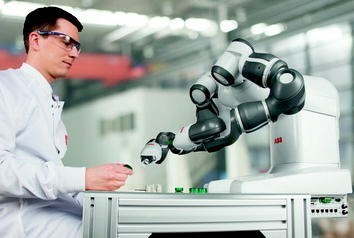 The ABB YuMi provides an outlook into the future of industrial robotics as it contains a great number of new technologies that will become increasingly important for users worldwide. Safe robots will enable companies to simply set up new machines within their existing workspace, without requiring additional hardware. These advances in technology will also have a profound impact on the creative industry, from ensuring a safe environment when teaching robotics to students, to deploying large-scale, sensitive robots on construction sites.